"A friend of mine recently went to Mai Chau and when I saw the photos I knew I had to go. Mai Chau is not very well known and a lot of people didn't know where I was talking about when I said that was where I was going for the holiday. It is windy a 3 hour drive through the windy Thung Ke pass from Hanoi to get to Mai Chau. It is nestled in a picturesque valley surrounded by mountains, completely hidden from the development that you see around most of the rest of Vietnam." 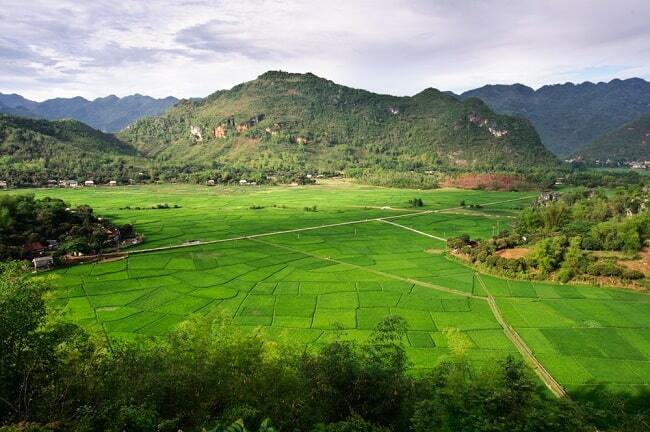 Mai Chau - is a small town in an area situated in an idyllic valley. It is surrounded by hills and a world away from Hanoi's hustle (135 km). The small town of Mai Chau itself is unattractive. The green rice fields outside the village look like a patchwork quilt scattered with small villages, where visitors can spend the night in traditional stilt houses. In the morning you wake up with a country sound of birdsong and rustling irrigation channels. The stilt houses protect the inhabitants against flood and also protect the animals. They can hide under there, if the weather is bad. The villagers of Mai Chau are mostly Hmong, Black Thai and White Thai. The White Thai is a minority, which is related to tribes in Thailand, Laos and China. Most don't wear traditional clothes, but the Thai women are masterful weavers and produce a range of traditional handmade souvenirs. The population is not as adept at selling their products. They are less commercial: so don't try to haggle. Mai Chau is not too far away from Hanoi as Sapa, which take 9 hours to come there. Because of this situation Mai Chau is often visited by tourists who are traveling in a group. They can also stay with families (homestay). They will cook for you and amuse you with delicious prepared foods and (maybe) a traditional dance performance. During the day you make beautiful walks through a beautiful landscape of rice fields. One lives here in most cases no longer of agriculture, but tourism. Over the weekend in Mai Chau it can be sometimes crowded, because the people of Hanoi come often here to spend the weekend. So try to go mid-week. 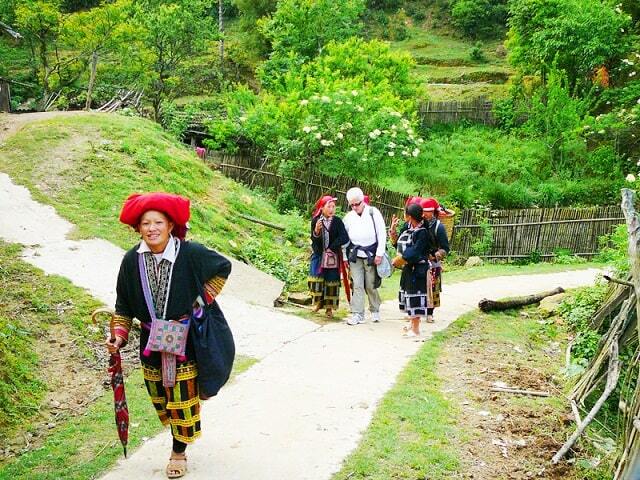 Due to its popularity, some people find Mai Chau too touristic; not real. If you're looking to discover something new, this is not the place to be. But for cycling, walking and relaxing, you can do very well here. Mai Chau is very suitable for this purpose. Many villages are a maximum of 3 km away from Mai Chau. These villages are very easy to reach - you can rent a bike or you can walk. If you want to visit a market, then the Pa Co Sunday market is a good option. It's situated about 20 km from Mai Chau, on the road to Moc Chau. Many villagers from the mountain villages come down to the market to buy or sell almost anything. Minorities are here in the majority. The market is a "must" for anyone, who's looking for a few good souvenirs or if you want to buy special products, such as honey, fresh fruit and vegetables, live fish, eels, snails or Vietnamese delicacies. 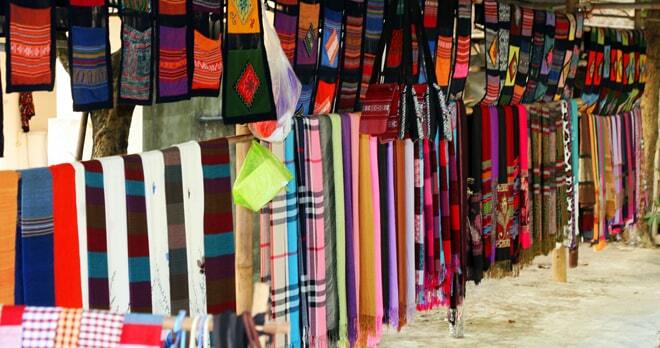 There are also traditional brocade woven products for sale, made by skilled Thai women. The Sunday market attracts a large audience. It is colourful with vibrant sights and smells will tickle your senses. Indulge your taste buds with traditional authentic Thai cuisine, and taste of the rice wine, which is made in the villages. In the villages near the town of Mai Chau, you have the opportunity to see the popular dance "Xoe" of the Thai minority. The "Xoe" dance has a long history and is dated around the year 1000 AD. In the beginning, the dancing boys and girls from villages are holding hands and they are forming a circle. This dance has become a tradition in the Northwest of Vietnam and is performed at many festivals. This dance is also performed, to welcome tourists, who come to their area. This dance has grown to 36 different dances and is a symbol of unity between the ethnic groups in the north-western region. Pu Luong Nature Reserve is suitable for hiking. On the outskirts of Mai Chau town is already a starting point to explore the Pu Luong Nature Reserve. This huge Nature Reserve is ideal for walking and get acquainted with the life of ethnic minorities. The reserve is home to a number of protected and endangered species - such as leopards and bears. 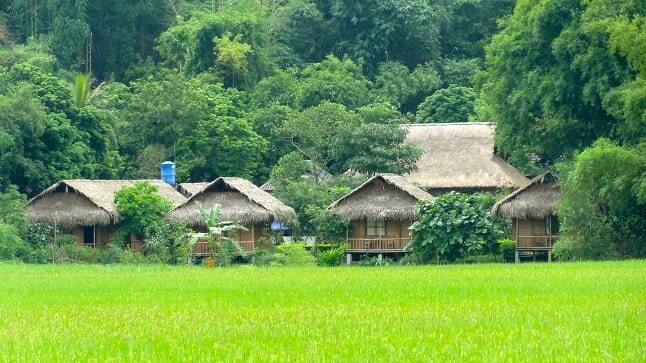 There are in Mai Chau to do many activities, for example a trip to the ethnic villages. You can see the farmers in their daily work in the rice fields. You can rent a bicycle or motorbike to explore the area. A visit to the cave Chieu is worthwhile, so is the Thai ethnic museum, or take a walk in the already mentioned Pu Luong Nature Reserve. Obviously, a wonderful sightseeing tour around the Hoa Binh is also a visit worth.